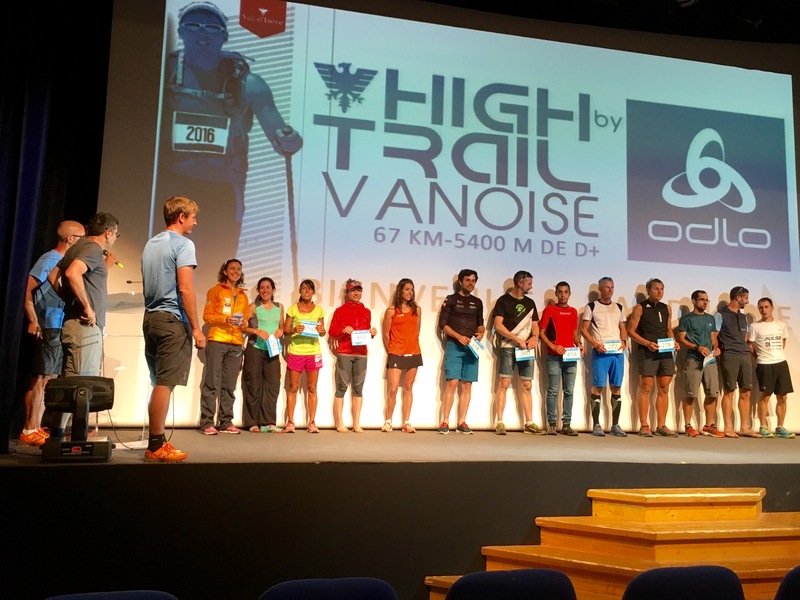 High Trail Vanoise 70km in Val d’sere France was the third race in the 2016 Skyrunning World Series. This recaps my difficult journey prior to the race, the new challenges encountered along the way, and my satisfaction with a hard-earned 5th place finish. Coming into High Trail Vanoise, my second race of the 2016 Skyrunning World Series, I felt nervous and honestly, a little scared. This would be my first race with this much snow travel, with a glacier at high elevation. High Trail Vanoise is 44 miles (70km) with 17,342 feet (5285m) gain between the elevations of 5900-11600 feet (1800-3500m). The average elevation is likely around 8750 feet (2700m) which is higher than the highest of my training runs in Missoula, Montana. Also, my training has been very sporadic since April. Coming into the season I trained very hard with the intention of improving my time at Transvulcania 73km, the first race in the Skyrunning World Series, where I placed 6th in 2015 in about 10 hours. With lots speed work and practice for mountain gain/loss, I felt prepared to race well. But I began heavy heat-training on top of peak training volume and more hours at work, and I believe I stressed my system too much. I became very sick in April and was unable to train much for 5 weeks. I was in bed the majority of 3 weeks and unable to work or race Transvulcania. Late in May, I was able to start eating more and running again and started my race season at Ultra SkyMarathon Madeira 55km, the second race in the Skyrunning World Series. But with much of my gains in fitness and endurance lost, I had to focus on running my best and keeping a positive mindset. I felt very pleased to be able to finish and was happy placing 6th in a stacked field. But I was also disappointed with myself deep inside. Two weeks later, I was also able to run the World Mountain Running Association’s Long Distance Mountain running championship in Slovenia for Team USA. Meeting so many outstanding athletes on my team was humbling but inspiring. Although my overall place was 24th, the lowest place I have taken in any race, I was very pleased to be the 3rd scoring American female and for USA women to take 4th among 15 nations. Despite my place, I had a fantastic race and smiled nearly the entire time. I was so happy to run again when only 3 weeks before I was unsure if I would ever be able to race again! These experiences taught me much about the mind and it’s power over our physiological abilities. Focusing the mind on forward progress is essential to improvement, but it is a practice. It requires work. I am pleased to understand this now and have more compassion for myself and my circumstances. After these races, I felt a strong sense of accomplishment for finishing but also a continued deep sense of disappointment that I could not understand. Mostly, I believe, because I know I can run better. But I also realize that with every race there is much to learn and you cannot always nail it on the first try. I have to always remind myself I started Skyrunning late in 2014 at the Rut 50km, less than two years ago, with only a few years of running under my belt. So I am very lucky to be in this place, running with such a high caliber of athletes from all over the world. Lately, I have learned much about the world’s highest performers from Michael Gervais’ podcast: Finding Mastery. A common theme amongst these conversations is the concept of grit. Author Angela Duckworth would define the concept in her best-selling book, Grit, as the winning combination of both passion and perseverance that drives the best in the world. Without perseverance our passions would be fleeting. I love running mountains but believe sincerely it will take much more hard work to approach a higher level of mastery for the sport. I see examples of grit everywhere in Skyrunning, and from them I am truly inspired. I learned more about myself yesterday at Vanoise than I could have hoped. I literally cried the first time I saw Grand Motte glacier because I realized how underprepared I was for the snow and elevation. I feared greatly making a fool of myself to the Skyrunning community I value and respect so much. But the race was overall a success. Not for my time or place but because I overcame such overwhelming fear. Early in the morning, we stared at 4am, I felt very honored to stand with Anna Cometi and Gemma Arenas, Spain’s top ultra-distance female skyrunners. Maud Gobert and Anne-Lise Rousset of France were also there and their great successes in mountain running are well-known. Early in the run, I exchanged places several times with a runner from Nepal, but when we started climbing snow she fell behind, and I am not sure how she finished. This put me in 5th position where I stayed the rest of the day. The glacier was breathtaking but not to be feared, and the experience was wonderful. Always, the sunrise and scenery are more beautiful than can be described and the spirits heighten with the accomplishment of the greatest climb of the day. Here the first ascent was 7000 feet (2130m) in 10 miles (16km) to 11600 feet (3500m) elevation on Grand Motte glacier. But the hardest parts of the day were yet to come. The second climb was over 3000 feet (915m) in less than 3 miles (5km) with many racers to pass from the shorter event. And the final climb to the second major peak included 6000 feet (1820m) gain in less than 5 miles (8km). On this final climb I was surprised to close a 13-minute gap to come within 50 feet (15m) of Gemma who was in fourth position, but she became aware of my presence and stormed downhill fearlessly in full-throttle, soon out of sight. I struggled substantially here on the final descent in the slushy, potholed snow to stay upright. And finally, after many miles returned to Val d’Isere, tired but happy to be done. I am extremely grateful for the opportunity to run here and the passion the Skyrunning Federation has for this challenging and life-changing sport. I am always quite shocked to be in the presence of such an incredible history as it unfolds. With the inventor of Skyrunning, Marino Giacometti, here at High Trail with Lauri van Houten, the director of Skyrunning, as well as the world-famous media specialist, Ian Corless, the finish line atmosphere was most electric. I hope we will someday have the honor to host this crowd of superstars in the USA at the Rut 50km, the next race in the Skyrunning World Series. High Trail Vanoise 2016 women’s podium. Photo: Ian Corless. Running into Le Fornet at mile 32. Photo: Andrew Pattison. You are a legend and true inspiration of mine. Your passion, perseverance, and grittiness mentality is bar none. I have no doubt your best is yet to come!! Thanks so much Katie 🙂 I think this sport brings out the best in people! Hello Kristina. I’ve been loosely keeping up with your exploits the past few months. I hope things are coming back together for you, as it seems they are. Having done a lot of ultras, marathons, shorter races and 4-13 hour adventure runs over the last 18 years, I understand the struggles. I think that we who love running super long distances sometimes forget just how brutal both the training and racing are to our bodies. It’s so much fun when we’re “on”, but we forget that sometimes the body needs to be “off”, and sometimes it forces us. Honestly, quite a lot of the really good runners out there who blog only write about the good times. When their bodies and minds start to fail them, their blog goes silent, sometimes permanently. I find your honest documentation of both triumphs and struggles much more inspirational to read about, and I hope you keep it coming no matter the outcome. Hi Albert. Can’t tell you how much it means to me for you to reach out in this way. It’s very hard for me to be transparent and vulnerable enough to talk about my weaknesses but I hope that others can learn through this journey. I agree we can be too hard on ourselves and stop listening to our bodies. Is there a way to follow your journey somehow? Thank you! And I will do my best to keep being honest! Thanks for the FB friend request! My wife and I post a lot of running related things but you’ll see a lot of things about my daughter and her college gymnastics stuff, my son and his airline pilot stuff, basketball and baseball and also our dogs. My wife is an occasional and successful racer herself and far tougher than me, with a 1st place at Man Vs Horse 50 and 25, 2nd place at Crown King two times, and a second at Man Vs Horse 25. Anyway, I look forward to more posts, and maybe one day we’ll cross paths! I’m doing the Flagstaff Sky Race 55k in October for the second time after it totally destroyed me last year. It’s a good one if you ever come down to AZ! That’s great! Excited to follow your journey as well! Your wife sounds amazing. I did flag in 2014 it is a great race. Love Jamil! It destroyed me too! I’m on the fence this year. Stay in touch!